Do you want to improve your English? The Adult Literacy Program at the Camarillo Public Library can help you read and write better English. We can also help prepare you for high school equivalency diploma tests, citizenship, and vocational training. 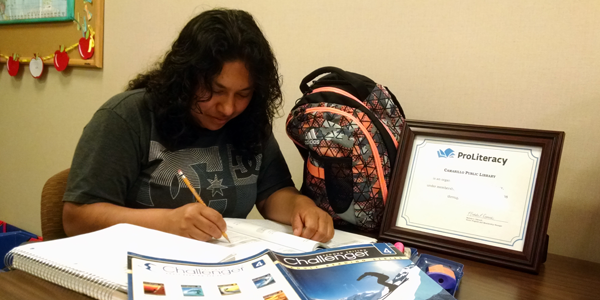 We offer free tutoring for adults ages 18 and over, for both English learners and native speakers. For more information, please contact us at (805) 388-5580 or literacycenter@camarillolibrary.org. The Adult Literacy Center office is currently open for general program information by appointment only. The Adult Literacy program is offered in partnership with Oxnard Adult School. Do you want to share your love of reading? The Adult Literacy Program at the Camarillo Public Library needs volunteer tutors to help adults improve their reading, writing, and speaking skills. We can train you to work with adults in one-on-one sessions to tutor them in reading and writing. No experience is necessary; only a love of reading, a desire to help, and the ability to commit to at least 6 months of volunteering is required. Must be at least 18 years of age to become a tutor. For more information, please contact us at (805) 388-5580 or literacycenter@camarillolibrary.org.